The UCSD Guardian has discovered that while the Theatre and Dance Department offered 21 laid off production employees replacement jobs, the positions require “new skills” and pay up to 30 percent less than their current positions, which will be dissolved this January. If an employee is rehired by the university, they will be given a nine month contract with a summer break rather than the standard year-long contract, which amounts to a pay cut of up to 40 percent. Hourly pay will be $19 to $20, a decrease from the current wage, which starts at $25. The production staff, many of whom have been employed by the university for up to 30 years, put on numerous shows at both UC San Diego and La Jolla Playhouse, and were told they could apply for positions at either institution. According to Will Widick, who worked as a joint staff member for the Theatre and Dance Department and La Jolla Playhouse for 14 years before being laid off, only one open position is listed at the Playhouse, and the window to apply for a replacement job at UC San Diego closed today, instead of Friday as announced. In their “Dedicated Staffing Plan” issued by the Department of Communications and Public Affairs, the Theatre and Dance Department and the Playhouse avoided guaranteeing replacement jobs, but stated they would be creating an equal amount of jobs to laid off employees. “In the new staffing model for the UC San Diego Department of Theatre and Dance, 21 positions will be created; those laid off are encouraged to reapply for production positions,” the statement reads. Widick told the Guardian it’s unlikely everyone will be rehired. The production employee also told the Guardian he believes the university is seeking younger staff members who are less skilled and more willing to take low-paying positions. While the administration has not announced who they plan to hire, the decision to lay off veteran production employees resembles recent layoffs at UC San Francisco, where 17 percent of the IT staff at the university were replaced by younger, foreign technicians. 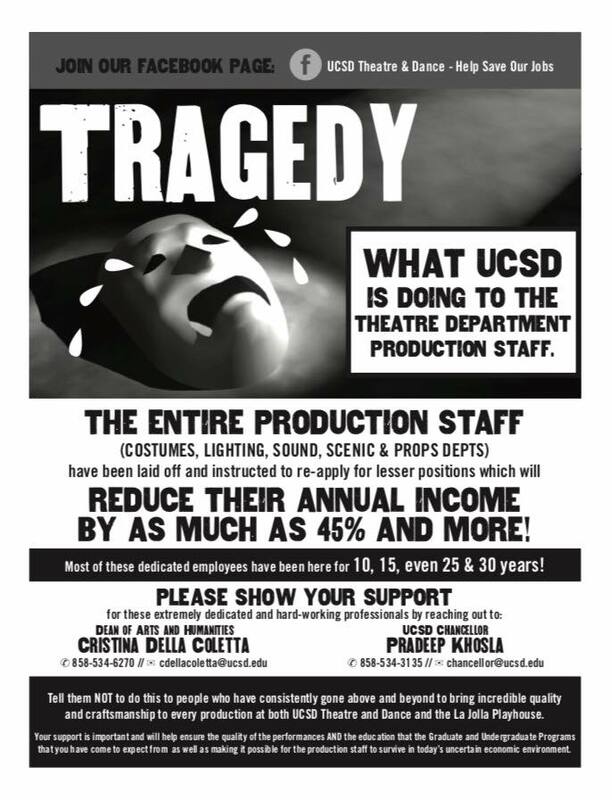 An employee-led retaliation against the layoffs is taking place on Facebook, where a public group named “UCSD Theatre & Dance – Help Save Our Jobs!” has amassed a following of over 1,400 people. Posts include testimonials, copies of letters sent to Chancellor Pradeep Khosla and requests to sign a change.org petition calling for the Chancellor to suspend the permanent layoffs and open a dialogue with staff members. The University Professionals and Technical Employees union has aided employees in raising awareness about the layoffs, paying for flyers that are circulated at campus events and urging individuals at the administrative level to reconsider their decision to eliminate the jobs. This “Help Save Our Jobs” flyer is being shared around the internet to raise awareness about the Theatre and Dance Department lay offs. 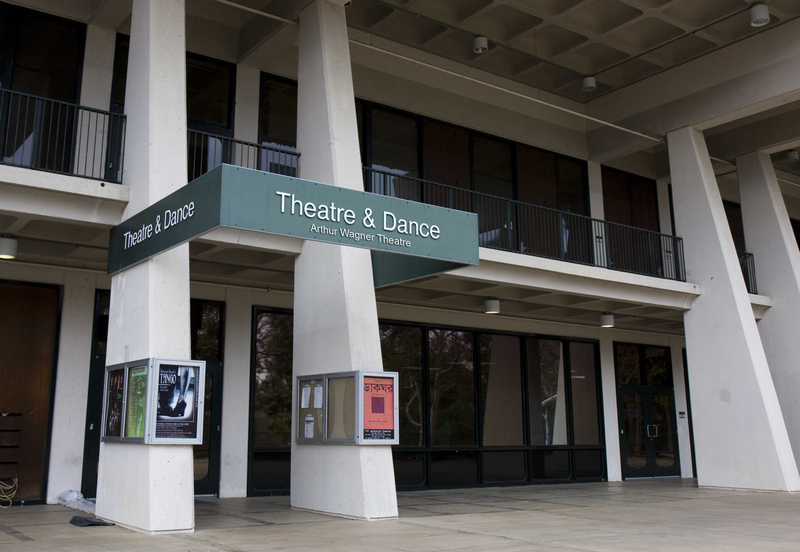 Every Theatre and Dance Department employee was considered “joint staff” before the layoffs, working side by side with staff at the Playhouse to produce all productions there and at UC San Diego. According to Joe Huppert, the sound supervisor of the production staff, joint staff stayed on UC San Diego’s payroll when working at La Jolla Playhouse, with the Playhouse reimbursing 50 percent of their UC compensation. Many on the Theatre and Dance Department’s production staff worked on Playhouse-born shows like Jersey Boys and Memphis, which went on to win Tony awards. Mike Doyle, the lighting supervisor, has worked on 26 shows that eventually appeared on Broadway. Widick, who is serving as a proxy for the many production employees who applied for the replacement jobs and are afraid to speak out about the layoffs, emphasized the production staff’s expertise in putting on award-winning shows. The Playhouse was contacted for comment, but forwarded our call to their main office, where the press relations staff member had gone home. The office employee reached at the Theatre and Dance Department everyone authorized to speak to press was busy. A full list of the laid off employees and their years of experience with the Theatre and Dance Department can be viewed here. 11/27/16 12:50 p.m.: Information added. 12/5/16 12:24 p.m.: Information added. 12/7/ 5:07 p.m.: Link to change.org petition added. Thanks so much for this article! It’s a very scary precedent for the UC to use mass layoffs as a way of decreasing costs. They know that the unions can’t file grievances over layoffs. It used to be, if you laid someone off, that position had to stay vacant for at least 6 months, as it should be if the layoff is due to a legitimate lack of work or funding for that position. Now they’re rehiring right away. This is another sneaky way of balancing the budget on the backs of staff, many of whom are already struggling to make ends meet. The union that represents me is only being offered a 1% raise over 5 years! How do they expect the people who work here to pay rent in this area?